In the late 1980’s several Japanese games companies began looking at ways of reducing operator costs to make purchasing their latest games more attractive from a cost perspective. The 1985 move to the JAMMA standard paved the way for arcade operators to look at generic cabinets which would allow the operator to swap out games as they saw fit, so the next step to reduce costs was to logically look at reducing the cost of the games themselves. Capcom was one of the first arcade producers to come to market with a system that came with a motherboard that connected with interchangeable game boards. The CP System launched in 1988 with a motherboard that the operator plugged into the arcade cabinet and then a second smaller game board that connected to the motherboard and could be swapped out for another Capcom CP game board at any time. This set up was very novel at the time, but it was basically two pcb boards that plugged into each other rather than the more sophisticated and operator friendly MVS cartridge system SNK introduced in 1990. The CP system was also plagued by bootleg copies of its games, of which Street Fighter II was particularly affected. 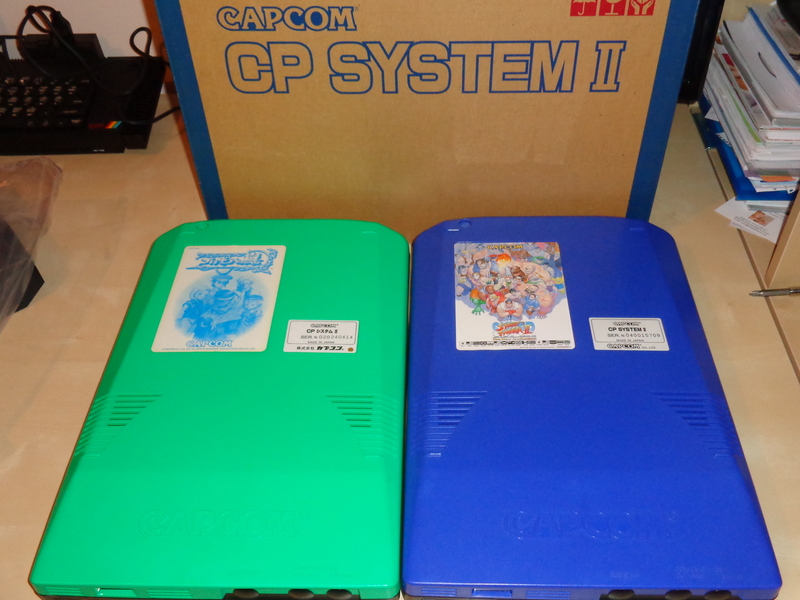 In 1993 Capcom launched the CP System II or CPS-2 as it is more often referred outside of Japan. 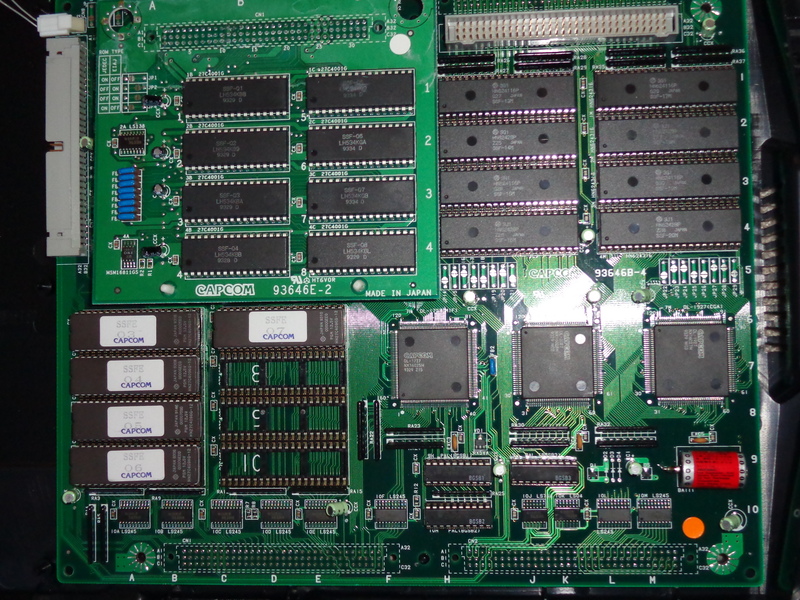 Similar to the CP System, the CPS-2 has an A-Board (the motherboard) and a B-Board (the interchangeable game board). The CPS-2 was more akin to the MVS system, whereby both the A-Board and B-Board were encased in protective plastic shells, making them much easier for the arcade operator to handle and store. However, whereas your typical MVS cart is approximately the size of a VHS tape, the CPS-2 B-Board’s are more the size of an actual VHS player!! 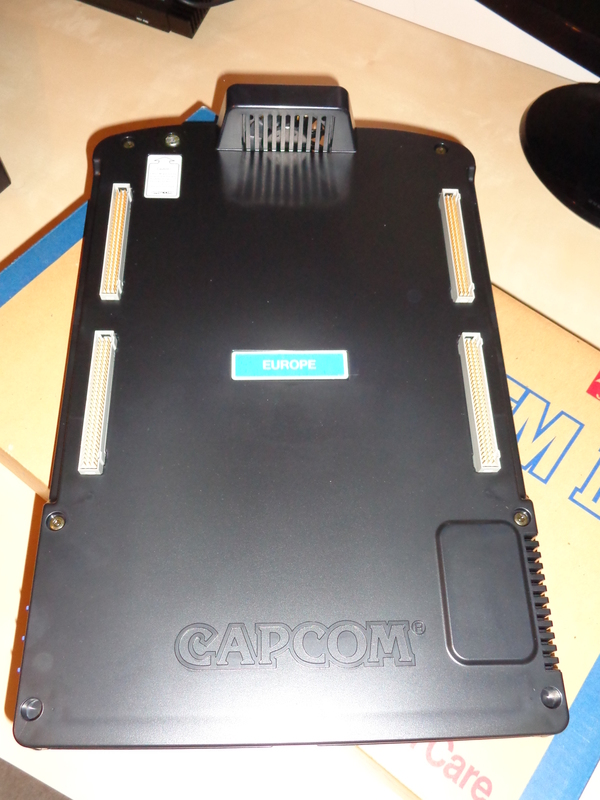 Capcom also sought to combat bootlegging by not only making region based hardware, but by also putting dedicated encryption keys on the B-Boards. These keys are powered by an on-board battery, which if tampered with, left to die (the battery will only hold charge for a finite amount of time like any other battery), would result in the game becoming unplayable – hence the term “suicide battery” being coined to describe this cunning feature of the B-Boards. There is also a Japan region, black, “all-in-one” unit consisting of both the A & B boards, but this is a unit more suited for a dedicated cabinet as the game on the board cannot be exchanged for another. As far as I am aware all the A-Boards are black. However, you cannot play any B-Board on any A-Board. The blue and green coloured boards of North America and Japan, respectively, are interchangeable; the other colour boards require their own region A-Board to function. So, depending on whether you feel the need to stay true to a specific region, you may end up with more than one A-Board in your house! Super Street Fighter II was the first game released on CPS-2 hardware, and following on from that the majority of CPS-2 releases were beat-em-up based games, chiefly in the forms of Street Fighter entries, the Marvel themed brawlers, and Capcom’s own Darkstalkers series. Peppered amongst these releases were some very notable side-scrolling beat-em-ups and shoot-em-ups, and a few puzzle games. Most CPS-2 releases have seen home ports to either the major consoles of the day, or latterly as DLC on PlayStation Network or X-Box Live Arcade. However, several CPS-2 games sadly did not get home ports and so their respective B-Boards are now very sought after. Cave developed Progear, Raizing’s Dimahoo (one of their very final releases), and the fantastic scrolling beat-em-up Alien Vs Predator are very good examples of this. In recent years the CPS-2 has become more and more popular with home arcade / Supergun owners, and the games not currently available on home console seem to be rising steadily in value as demand outstrips supply. Personally, unless one was getting into collecting CPS-2, the system is only worth getting for these un-ported titles. There are now many arcade perfect ports of the CPS-2 Street Fighter & Marvel games available on Sega Saturn all the way through to X-Box 360, so the arcade originals are not worth pursuing… especially considering the size of the B-Boards and the storage headache they would cause! Working to a budget? Look at securing an Asian A-Board and pursue its relevant B-Boards. Collectors seem to be more interested in the blue and green boards, and therefore they are more expensive to pick up. A-Boards can be picked up fairly cheap on their own, but keep an eye out for deals where both boards are being sold together. Check that the suicide battery has been replaced or that it is not leaking. Replacing the suicide battery is quite easy, but you need to know how to work a soldering iron and have the confidence to use it! Most CPS-2 owners recommend battery changes every 3 – 5 years, although by my own experience I have seen a new-old-stock board fire up after nearly 20 years with the factory fitted battery! Collectors tend to stay away from Phoenixed boards as they do not class them as original games any longer because of the process involved in “resurrecting” the board. Phoenix boards are fine if you’re just in it to play! Unless you’re collecting, stay away from kits. Complete original kits, nowadays, are rare, and expensive! For collectors only. Unless you want them running in your cab, I would stick to the home ports of the Street Fighter / Darkstalkers / Marvel games. Many of the major gaming forums will carry some kind of tech guru who will either replace the suicide battery or Phoenix your board for a fee. However, if the battery has leaked on to the pcb, chances are the game is scrap. The CPS-2 is a great system, with some of the best 2D games of the 1990’s on its hardware; however, with the prevalence of MAME amongst many gamers, and the fact most of the CPS-2 library has been successfully ported to home console anyway, it is really debatable as to whether CPS-2 is worth investing in for personal use. Unless you are a collector, or feel that having the original is preferable to emulation, CPS-2 is a system, I reluctantly have to say, that is better left in the arcade.